Aviatrix Systems provides the next generation cloud networking solution built from the ground up for the public cloud. Aviatrix simplifies the way you enable site to cloud, user to cloud and cloud to cloud secure connectivity and access. The solution requires no new hardware and deploys in minutes. Aviatrix CloudN is a virtual appliance deployed in datacenter. Aviatrix Cloud Interconnect (ACX), also known as Datacenter Extension is a unique technology on CloudN. It manages your public cloud address space and allows rapid scaling of AWS Virtual Private Cloud (VPC) by removing the pain point of building secure connections to the VPCs. Manage Cloud Address Space No more spreadsheet to manage your cloud address space. Easy to Deploy Deployed without touching existing network infrastructure. 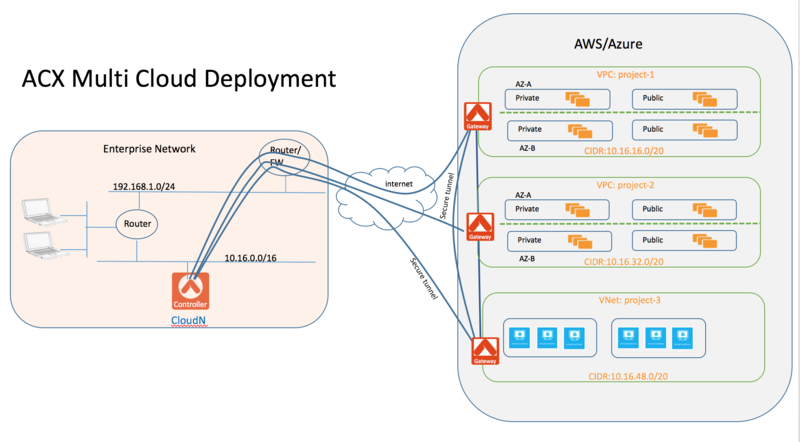 Fast to Provision Provision a VPC with secure tunnel to datacenter in minutes. Simple to Use 1-click operation to create and delete VPC with secure tunnels. Rapid Scaling Creates multiple VPCs in any region with secure connectivity. Full Mesh Connectivity inter region VPC can be securely peered in minutes. IT Supported Self Service Work flow allow multiple users to create VPCs. Remote Access Capability. Built in VPN server allows remote workers to access VPC directly. Ideal for partners and remote workers. CloudN uses a mixed Layer 2 and Layer 3 technologies whereas the CloudN virtual appliance behaves as a Layer 2 bridge and Gateway (launched by CloudN at VPC creation time) behaves as a Layer 3 router. The design of CloudN as a Layer 2 bridge makes it possible to build an overlay IPSec tunnel to AWS VPC without involving edge routers in the network. The design of Gateways as a Layer 3 router makes it possible for the VPC to fully utilize all AWS VPC underlying infrastructures and services without requiring any software agent reside in any of the instances. Instances within the VPC communicate with each other directly and transparently without involvement of Gateway. From the user’s perspective, what CloudN creates is a standard VPC. CloudN views each VPC as the smallest autonomous environment, it allows you to create security policies to deny any subnet or hosts on premise to access any VPC. For example, you may want to block developers from accessing production VPC. By default, inter-VPC communication is blocked. By using VPC/VNet peering capability, you can establish direct secure tunnels among VPC in the same region or across different regions. Enterprise users can access instances seamlessly in all private and public subnets over the secure tunnel using instance private addresses. All instances on private subnets can reach back to enterprise. Optionally packets from instances on private subnets can reach Internet directly without being first sent back to the enterprise. CloudN works by dividing the subnet where cloudN is deployed into sub segments (or smaller subnets). The VPC CIDRs created by cloudN are one of the sub segments. The mechanism is illustrated below. VPC in the below diagram could be replaced with a VNet. Where a local subnet 10.16.0.0/16 has a default gateway 10.16.0.1. The subnet is divided into 4 sub segments. The default gateway and CloudN IP address fall into one segment. The rest of each segment is mapped to a VPC CIDR, in this case, the VPC CIDRs are 10.16.32.0/19, 10.16.64.0/19 and 10.16.96.0/19. If this subnet 10.16.0.0/16 is reachable from other network in the enterprise, then the instances inside each VPC takes private IP address as if they are on the local subnet 10.16.0.0/16. For users in the enterprise, it is as if they are communicating with hosts on the local network. You need to have an AWS account to use most of the commands on CloudN. Note that CloudN support multiple cloud accounts with each one associated with a different AWS IAM account, but there needs to be at least one to start with. CloudN manages your cloud address space. Carve out an unused consecutive network address space in your datacenter. The CIDR block of this address can be determined by how many VPCs you will need and how big the address space you can allocate. For example, a CIDR block with /16 address range can create as many as 254 VPCs. Once you have created all the VPCs from the allocated address space, you can always allocate a new address space and launch a new CloudN virtual appliance. 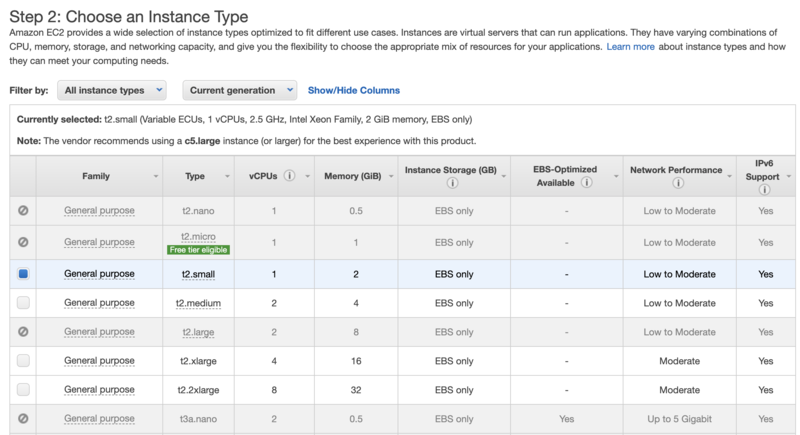 Reference the startup guide to deploy the virtual appliance. Upon login to the controller for the first time, follow the onboarding process to create a cloud account that corresponding to an AWS IAM account. Aviatrix CloudN uses the account IAM credential to execute AWS REST APIs to create VPC and necessary resources. After going through onboarding steps, click ACX. Provide a name for the VPC you are about to create, select an AWS region, and click Launch. In a few minutes of time, a VPC, public subnet and private subnet in each AZ of the selected region, IGW and routing tables will be created; an Aviatrix Gateway will be launched and an encrypted tunnel will be created. You then can launch instances in the VPC and access the instances by their private IP addresses. Repeat the above step for more VPC with encrypted tunnel creations.